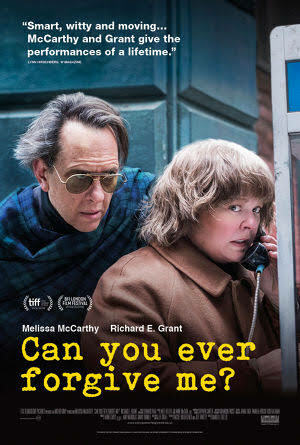 »Culture & Arts»Film Review & Trailer: Can You Ever Forgive Me? Film Review & Trailer: Can You Ever Forgive Me? I have to admit that a fact-based drama about the fraud of collectible letters, supposedly written by literary greats, didn’t sound like the most appealing prospect. However, Richard E Grant’s Supporting Actor Oscar nod, and his joyous response to it, piqued my interest in this. And yes, it is indeed about the aforementioned fraud. But don’t let that put you off. It tells the true story of how author, Lee Israel (McCarthy) fooled numerous buyers of collectibles, by forging letters from well-known writers and wits, such as Noel Coward, Dorothy Parker, and Fanny Brice. Although acclaimed for previous work, she had hit a rough patch in her career, and, struggling to pay bills and rent, she saw it as a way out. She is enabled by her friend, Jack Hock (Grant) a flamboyant homosexual, and occasional drug-dealer. Unfortunately, she becomes the victim of her own success, as she starts peppering the letters with information that is far too intimate, which raises suspicion, and eventually alerts the FBI to her activities. It’s actually a really fascinating story. I wasn’t fully aware of it beforehand, but I found it astonishing just how interesting the tale of someone, basically typing fake letters, could be. Obviously, literary forgery isn’t exactly high-octane stuff. However, Israel’s curmudgeonly personality, coupled with Hock’s outrageousness, makes for a wonderful dynamic, and really keeps you engaged. Both McCarthy and Grant are fantastic, and have a great chemistry. With the help of a thoughtful and well-paced script, McCarthy manages to do the near-impossible, and make an extremely unlikeable personality (even Israel’s friends have acknowledged that she was “difficult”) seem almost warm and misunderstood. Meanwhile, Grant has crafted a wonderfully complex and layered character, even though on paper Hock could easily appear quite shallow. Heller does a great job building the story to keep it interesting, and there are some wonderful comedic moments that interject nicely with the subterfuge. She manages to keep the viewer engaged throughout, even if you think the subject matter isn’t your thing. The focus is very much on the dynamic between the protagonists, rather than the intricacies of the fraud, and the movie is all the better for it. With two gay characters as leads, it would have been easy to make this an OTT offering, designed purely to appeal to the LGBTQ community. But their sexuality is secondary here, and isn’t referenced every five minutes, which is refreshing (although the AIDS crisis of the era also isn’t ignored). Part of the joy of this film is that you don’t really know what to expect. Although the story is in the public domain, it is unlikely most people going to see this will know much about it. While it sounds like quite a niche subject-matter, it turns out to be a very human and heartfelt story. Although it never reaches the excitement levels of other fraud movies such as Wolf of Wall Street or Catch Me If You Can, it is surprisingly tense, and keeps you gripped. It has certain poignancy to it that will linger after the credits. Grant is totally deserving of that Oscar nod, and this is a wonderfully (and surprisingly entertaining) drama. It’s not as highbrow as the subject matter suggests, and if you are looking for a really interesting story, beautifully portrayed, that will keep you engrossed till the final frame, then this will do the job. ← ‘BeLonG To’ holds Transboree!